The new storefront works well, but gamers would benefit from a few more buying options, like gifts and a wishlist. 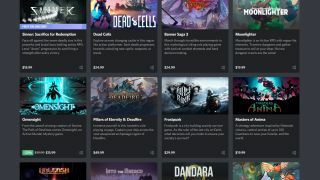 Discord opened its own game store this week, which includes some limited-time exclusives plus Nitro, a subscription-based service that lets you play around 60 different games for ten bucks a month. Discord's offerings are pretty slim in comparison to more established digital storefronts, but at the same time it's genuinely refreshing to see a carefully curated collection of quality games instead of the overwhelming heap you find elsewhere (*cough* Steam *cough*). As a storefront, the Discord Store has a cleaner presentation than Steam, although that can be chalked up mostly to the limited selection and a general lack of features. There are no user reviews, so you can't see what other Discord members think of the games, just a Metacritic score (most games available are scored above 70). There's also a short paragraph for each game from a Discord staff member to serve as a recommendation, which is nice. I really couldn't tell you how any member of Valve feels about any particular game on Steam, so this gives the Discord Store a friendlier, more personal feeling. Discord also supports cloud saves, which is great news. There's no wishlist to bookmark a game you might want to buy in the future when and if it's on sale. Discord accepts credit cards and PayPal for purchases, though the PayPal option doesn't use your balance and requires a linked credit card at the moment. There's also no option that allows me to buy a game as a gift for a friend. There is sometimes a link to the verified Discord server on a game's store page, which might be a nice alternative to something like the Steam forums if you have a question for the developers or need help with the game you're playing. It's also direct access to a community, which could be great for smaller multiplayer games. You can bulk up your Discord Library with games you already own from other services: Discord detects your other games and they can be launched right from your Discord library tab. However, at least on my PC, Discord only detects some of my Steam games and not others, and at the moment there's no way to manually add the games it's missing. It can also launch games from Origin and Uplay, plus it shows Star Citizen and Minecraft in my library, which each have their own launchers. It doesn't show Sea of Thieves from my Windows Store library, however, so the detection systems feels pretty hit-or-miss. I purchased Bad North from Discord, both because I wanted to try the game and because it's currently a Discord limited exclusive only coming to other storefronts later this year. Except for Avast Antivirus attempting to seal the executable in its virus vault (which only took a moment to rectify), the game launched and ran fine from Discord, though Bad North does contain DRM that requires an internet connection and Discord to be running. A Discord representative says an offline mode is planned. And, after playing Bad North for a few minutes, I requested a refund—not because I don't like or want Bad North (I think it's pretty neat), but because I want to see how their refund system works. The terms are the same as Steam's: if you've played a game for fewer than two hours, and purchased within the past two weeks, you're eligible for a refund. The refund process is a bit more time-consuming than Steam's, however. First, I filled out this help center form, including the purchase ID, the game's title, and the email address for my PayPal, which I'd used to purchase the game. I received a confirmation via email that my request had been received, then another email later the same day asking me to reply to confirm the email linked to my Discord account and the name of the game I'd refunded. The following day, I received another email saying my refund had been accepted and that I'd have the money back in 5-10 business days. Discord's refund policy also states that Nitro subscriptions can be refunded with five days of the initial purchase date, and that DLC and in-game purchases are unavailable. The Discord Store is only a few days old, so we'll keep an eye on how it grows in the future. We'll also have to see how it handles game updates and patches as compared to the other digital stores. For now, it's a clean and pleasantly curated experience with some quality games to choose from, but a few more features like an offline mode, wishlist, and gift options would go a long way to making it feel like an essential game store. You also might want to read up on, and opt out of, the recent changes Discord made to it's terms of service.